The Prayer Points In The eBook Explained. Do you know that the prayers in the eBook which have transformed many cheating husbands, in deep cheating and divorce cases, have also not worked in the hands of many others? The will of God for every marriage is the same: to be married to the end of life. God does not permit adultery or divorce. We never read in the Bible where God allowed a husband to put away his wife and marry another. So, we have proved that the Word of God in targeted prayers work for all people in same circumstance. I will tell you a short story to begin today's very important counsel. Two Men, One Mantle, Same Job. There’s this interesting story in Bible. Elijah, the Prophet of God was scheduled to be taken up to Heaven. He was going to the venue of his 'flight' with his personal assistant, Elisha. When they got to River Jordan, Elijah struck the river with his mantle and that river parted, so they passed over on dry ground. A little later, and down the next village, the whirlwind scooped Elijah up to Heaven. But his mantle fell off him. And Elisha grabbed it. On his way back, Elisha had to pass River Jordan alone. No sweat because he had the mantle of Elijah in his hands, and he remembered how exactly Elijah used it an hour ago to part the great River Jordan. So he struck the Jordan the same way. The Jordan parted and he crossed over! (You may read this story in 2 Kings 2: 1 – 14). You see it worked in the hands of Elijah, it also worked in the hands of Elisha. I doubt if Jordan would have parted if Elisha had used Elijah’s slippers or just thrown the mantle into the river. How To Improve The Working of Prayer Points. There is a way to engage a tool to bring desired result. There is another way to use the same tool and it will utterly fail. 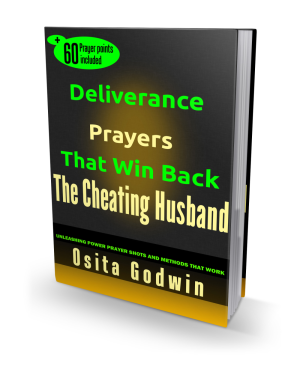 So it is with the prayer points in the eBook Deliverance Prayers That Win Back The Cheating Husband. It bothers me that some people do not know what to do with the prayer points outlined in that Holy Ghost inspired eBook. During prayer, some women read it verbatim, or chant it several times. Others don’t even know how to start, just stare at them... and weep. 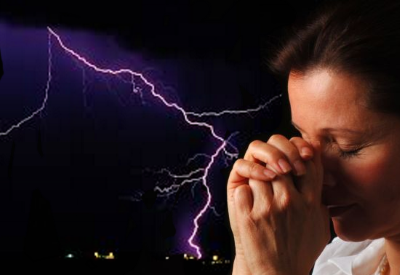 Though I have gone to great length to explain how to develop these prayers in that eBook and in previous eZines editions, many women just skip these instructions and land on the prayers out of desperation to shorten the period of their husband's cheating. As a result, they struggle without much to show from the prayers. But in this edition, based on what I have observed from many of you, I will treat some very, very key questions on the engagement of the prayer points. I will make this as simple as possible, and even show how I prayed one of those prayers for somebody last night. I recorded it and transcribed it here for your benefit. You should be able to apply this to other prayers you do and really pray them for quicker victory. The majority of you reading this eZine are in prayer partnership and agreement with me over their husbands and marriages. Our objective is to swiftly get your husband free from the tangle of the strange woman, and bring him back, faithfully committed to your marriage, for life. This is the will of God which is being validated in the lives of hundreds daily. You shall have your day really soon. I just know that prayer works. It will work for you too, in Jesus name! Prayer remains your best approach to taking back your husband and restoring your marriage. But like most things that bring lasting result, you’ll have to follow an order, or a process, to get your desires fulfilled. Do You Think Some Are More Gifted To Pray? •Prayer is not a talent or gift. Nobody has special privilege or opportunity to successful prayers, but anyone can press in and tap into the tremendous power of prayers. So, prayer is more like a discipline, a skill, taught and practiced effectively when you are in a right relationship with God. •Prayer is not a magic chant. Petition and deliverance prayers (the type we pray for your husband and marriage) are generating and releasing spiritual power to overcome an undesirable situation or adversary. The prayers for the change of a husband in five year serial adultery is definitely different than that of a husband in an emotional affair. This point is important to note. Often women, who have struggled with a cheating husband for years, want a change the next week. This is a legitimate desire but not a realistic one for the prayer process. Some become impatient to pray further and would be asking whether to give up on their marriage. I Need Your Donation For Our Prayer Ministry. I sincerely appreciate the few people that God has moved to send us financial support by way of donations or gifts. God uses them to encourage us and keep this Prayer Mandate for Marriage Restoration thriving. That’s why I usually communicate my personal appreciation to them by direct mail. If you are blessed by this Ministry in any way, consider sending us an offering, a gift or donation. The Donation Button on the top right of our website is now active. It is hosted by PayZa secure systems, so it only accepts VISA card or transfers from PayZa members. The VISA card is easy to obtain from any bank; and the PayZa membership is free and easy to sign on. However, if you do not want to use those, you may send me donation through the Western Union. If this is your preference, write me for details on how to send it. God will not let you and I pray in vain. I have never truly prayed in vain. Your husband will return faithfully to you, and your marriage will be pleasantly refreshed. God is faithful. The Answers To Praying Right And Winning. I will mention some of the common questions that majority of you ask and provide the answers. 1. Do I just say the prayers as given? The prayer points offer direction. They are the direct path to the desired result, your husband change and marriage restoration. Without direction you will not get where you need to be. But the prayer points are the raw goals, often needing some sort of development. This should not be hard since you already know what you should ask for. Prayer points are very proper because they keep you in line with the will of God. In the past, we have seen women ask for the death of their cheating husbands, or for them to fail in business. These are not in the will of God for reconciling a marriage. If God needs to do any of those, it is His discretion; not for us to ask because it does not show a heart of love – and you need love to work with God. See the prayer points as pointing to your spiritual power-bank; it is the revealed direct path to the refreshing of your marriage. So, you may say the prayers as they are given, but you are also expected to add your own words of desire and desperation… in the direction we have specified. 2. Some of the prayers are too short, I finish them in a couple of minutes. This question is related to the point we just treated. The prayers are not too short, they are just right to give you the complete idea of the focus of prayers. You’ll have to develop them when you are praying them. Below these explanations, I have given a sample of the prayer number 45 (one of the shortest prayer points in the eBook), which I prayed last night for someone. I’m sure that example will enlighten you and equip you to pray the points completely. Developing a prayer point does not mean including empty words or repeating a phrase over and over. Rather, it is pouring out your desires unto God, thereby extracting all the powers in that prayer to help you. So an undeveloped prayer point is not fully utilized. If you still need special help on how to develop particular prayers, let me know. A very powerful way of utilizing a prayer to the fullest is praying in the Holy Ghost, also called praying in the spirit, or praying in tongues. You will see in my prayer below how I prayed in the spirit as well. You need to start on this, if you are not already enjoying it. The baptism of the Holy Ghost is a smooth gift, once you are born again, which can be received in five minutes (I will discuss this in subsequent edition of the eZine). Praying in tongues do not only make prayers exciting, but gives it more audacity and breakthrough. 3. Most of the prayers are relevant to my situation. Can I pray them all in one week? The motive for putting all the prayers in one eBook is to select from them, not to pray all of them in one prayer session of 21 days or less. Note this: The power of prayer points is in focus, tenacity and consistency. The more you pray a point to the exclusion of others, the more you extract all the power from it. If at a later date you start a second prayer session, you’ll be building on the strong spiritual foundation of the previous prayers. This cumulative strength will surely lead to an explosive victory for you. This is what I have experienced many times. I expect you to pray one set of prayers to the extent that you may not need to read them again to pray the next time. Rather, it will just come from memory when you want to pray them. Also, when you pray them heartily, consistently, they get implanted in your spirit, and you find yourself even praying them in your dreams. That’s where I want you to get because once you start to pray from your spirit, you know you are really close to your answers. 4. Can I still pray other prayers from elsewhere? It is ok if you pray other matters from elsewhere, or as your mind brings them up. In fact, you should pray for other things too, your marriage is not the only thing that’s important to God! However, whatever prayers you make should be in addition to the ones we have agreed on. You should not abandon or substitute the prayers concerning your husband and marriage. This is because it is a prayer of agreement, which I will be praying here for you too. A prayer of agreement is one where two or more people pray the same point (see Matthew 18:19. 5. What do I do when I miss my prayers? I understand that sometimes people miss their prayer days for one reason or the other. If this happens for a day or two, just continue the prayers and complete as scheduled. But if it goes on for three days or more, you’ll have to restart the entire prayer session from the next day. The prayers you did before the interruption should be repeated. Do not just chant or mumble the prayers when it is obvious that you are about to miss the day’s prayer. If you do that, you will only be deceiving yourself. “Be not deceived; God is not mocked: for whatsoever you sow, that shall you also reap.” Galatians 6:7. 6. Which time zone do I use for my midnight prayers? I cannot make the 12 midnight prayer times. I have come to know that the hours of 12 midnight to 3am are the most fruitful for petition prayers, personal supplication and deliverance prayers. However, some of these prayers also succeed when prayed intensely at other times. Some people can’t pray between 12 midnight and 3am because of serious reasons of ill-health or other unavoidable duties. It should never be because of sleep. Remember prayer is a discipline! So when you cannot pray for those reasons at midnight, find any other time of the night when you can concentrate without distraction, and pray. Your time of prayer should be the time of the location where you are. When I travel, I pray the midnight prayer in the time zone of my host country or location. 7. How do I use the scriptures you attach to the prayers? The Bible references are witnesses that your prayer points are in the will of God for you. You are supposed to read the scriptures in context (read the whole chapter but meditate on the verse of reference). When you do this sufficiently at the onset of the prayer session, they will stick to your spirit, and you may not keep reading them each time you pray. If you ponder on the scriptures adequately, you will be charged each time you pray, so you can mention that scripture to God (see Isaiah 41: 21 and Isaiah 1: 18). That is the job of the scriptures. You may even find other related scriptures which you include to the given and have a fuller prayer experience. The way I prayed this prayer in my house for 15 minutes last night. Scripture preparation: I read Isaiah 8 and pondered on the verse 10. “Father, I thank you for the marriage covenant between me and my husband Mr…. I appreciate the privilege of being married to a wonderful man like him. Thank you, my Father, in Jesus name. So, Father, I come to You for help to recover my husband and restore my marriage from the enemies of my marriage who have come to destroy our marriage and take over what you ordained for a lifetime. They are working to forcefully take over my husband from me. Lord, in the name of Jesus, defeat their motives, plans, activities and scatter all their plans and schemes. Father, release Your battle angels to their locations and defeat them for me but recover my husband to return to me. I pray, in the name of Jesus, against their methods and devices and I ask that every diabolic or fetish methods of operation against me, my husband and marriage be nullified. As you forcefully released the Isrealites from their Egyptian task masters, a people stronger that they, also release the grip of the strange woman and her helpers on my husband. Father, by your spirit, erase whatever impressions they stamped on the heart of my husband. Wipe away the taste of immorality and memory of their sinful lives that captivates my husband. Father, as you deliver my husband and marriage from their evil schemes, protect us from their attacks, and other evil encroachment in our marriage. Help us against arguments, disagreements and fault-finding in our marriage. Oh God, I ask you to renew the heart of my husband to love me only, to faithfulness and commitment to our marriage without immoral distraction. Father, I also pray for grace to sustain us with one perfect unity unhindered. Free Your Children From Their Cheating Father’s Blood. The countdown for the above mentioned eBook is on. By next month, my vendors will release the eBook for order and download. It is a reality that immoral lives of many fathers also manifest in their children later in life. Some do nothing, others wait until it is too late. Both are serious errors that have messed up marriages that would have been glorious. I have been heavily involved in successful 21-day prayers that have cleaned out this defiling genes and trailing evil spirits from children. There are some deep instruction and 30 power prayers to cancel these demonic strongholds from children. My experiences, spiritual insights, understanding and the power prayers are now packaged in this never-before eBook. It contains teaching on these generational curses of cheating, adultery, abusiveness, immorality, lying, drugs and alcohol addiction. There are 30 power-loaded prayer points for 21 day period, and your children will be free from monitoring spirit control from their lineage. I will be giving you more details and sneak preview in the next edition of this eZine. If you do not want what you see in your husband to show up in your children, you need a copy as soon as it is released next month, September 2016.